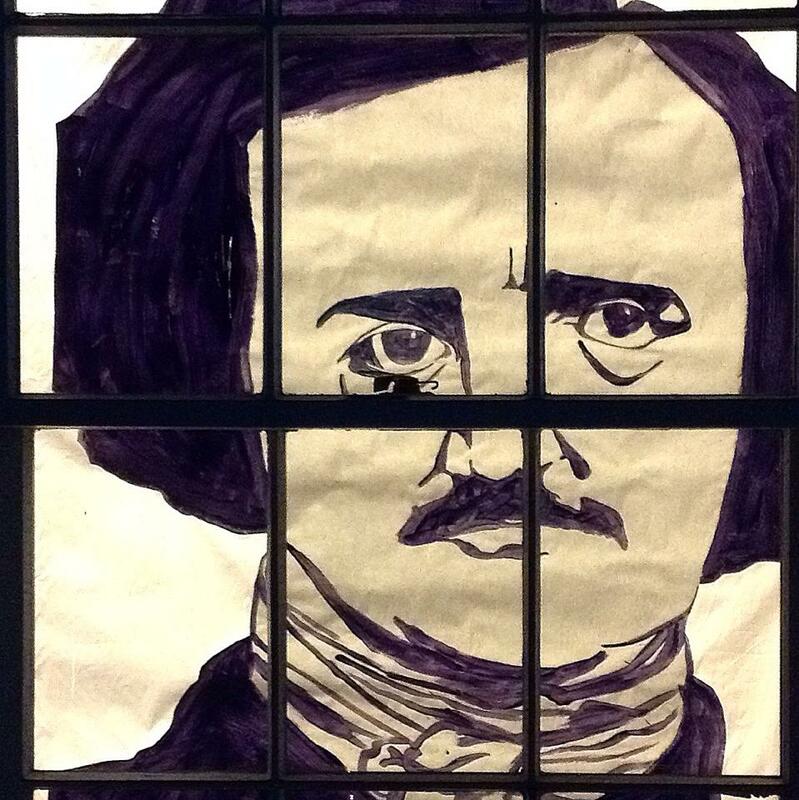 What do Persimmons, Poe, and Painting have in common – besides the letter P?!? All three were exciting happenings in the Library Garden this fall. 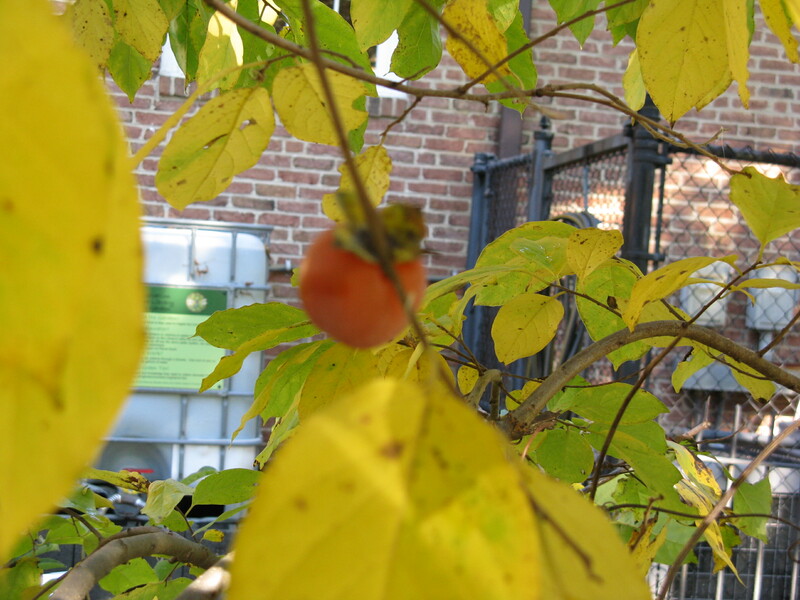 Our native persimmon tree (Diospyrus americana) grew her first two orange persimmons. They were so pretty we didn’t try to pick and taste. Maybe next year! On the Thursday evening before Halloween, Kenmore Middle School Drama Students haunted the Garden with dramatic readings of Edgar Allen Poe’s “The Raven” and “Annabelle Lee.” Lit by shadowy pumpkins and a starkly beautiful door-sized graphic of Poe himself, the Garden proved a perfect setting for the poems’ sense of brooding darkness in the face of loss of a love. 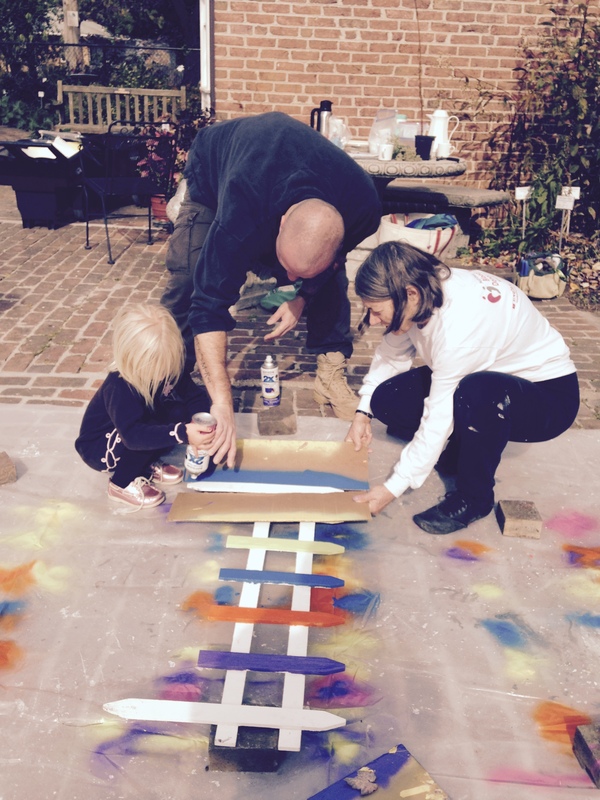 Brand new crayola boxes came to mind as Master Gardener volunteers worked with the 18 pre-school children of Carlin Hall to paint the pickets of the new fence decorating their Children’s Garden. MG intern Gabriel Eberhardt planned, organized, and implemented this project as part of his now completed 60 volunteer hours and MG certification. 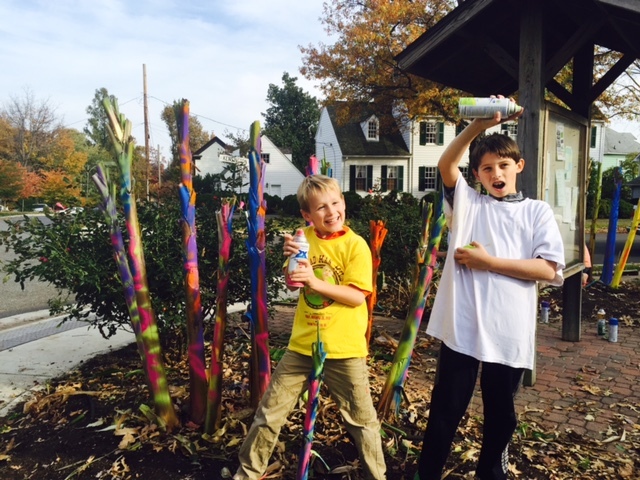 A second instance of painting involved MG Paul Nuhn, who as he does every fall, brought together a creative bunch of neighborhood kids to make colorful sculptures out of the leafless banana plant stalks left after our first frost. Their artistry is titled: Mod Stalking The Garden! Now the cold of winter is here, it is a wonderful to look back on the year, and reflect on how our fall events reached our neighborhood and broader community. We’ll be dreaming up exciting events for the spring, so stay tuned! This entry was posted in Demonstration Gardens, Glencarlyn Library Community Garden, MG in the Garden and tagged Alexandria, Annabelle Lee, Arlington, banana plant stalks, banana plants, Edgar Allen Poe, fall gardening, gardening, Glencarlyn Library Garden, Kenmore Middle School, Master Gardeners, persimmon tree, persimmons, The Raven. Bookmark the permalink.